Check out this superb new online slots game from Eyecon Gaming. All aboard, and full steam ahead, towards a really delicious slots experience! I’m sure that each of us, as a child, has had at least one dream in which we’re chugging through a magical candy land on a train made entirely of sweets. And if you haven’t, the good news is, you can live the dream now! 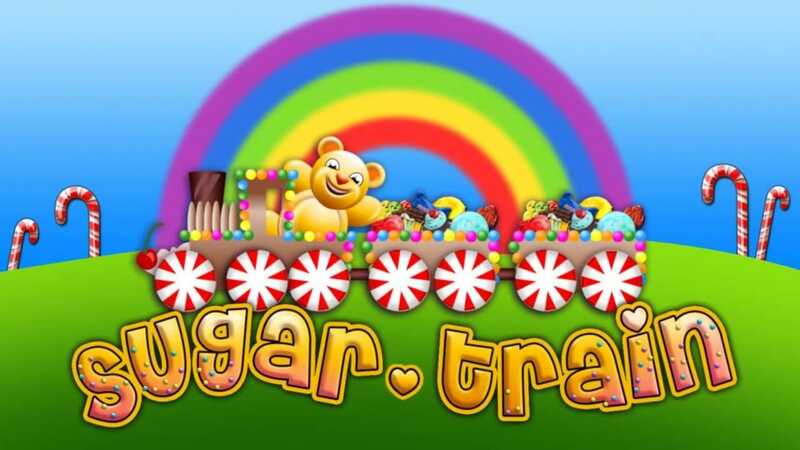 The Sugar Train is arriving at a platform near you, and it’s ready to take you on a scrummy journey through a land of sweet win lines, sharp bonuses, and gummy gambles. You can check out our entire list of recent slot games on SlotsBaby. The very best online slots games combine childhood nostalgia, and the memory of simple, idyllic pleasures, with the chance to stoke the furnace of your adult bank account. Sugar Train takes you back to the days when sweets were your currency of choice, and pocket money simply meant the chance for more sweets. It taps into that part of your psyche that longs to recapture that sugar rush. And of course, this form of sweet indulgence won’t result in a toothache, which is a great bonus (to add to the myriad bonus features that make up this slots package). Get ready for the ride! If you love promotions, check out Slotsbaby. Eyecon moves with the times, but has never lost their focus on the beloved basics of the slots gaming format. Their games’ bonus features are invariably the star of the show, and the traditional feel of their games gives them a satisfying, moreish quality that old-style slots players are sure to love. Sugar Train is set in a rolling landscape so smooth it might be green icing (and probably is). In the background are brown, cakey hills covered in white icing snow (and a shiny Morello cherry), and lollipops of different shapes and colours grow like trees on the hills and fields. A candy cane train track runs into a tunnel in a hill on the right, and on it, is the Sugar Train – five reels riding on rock candy wheels, constructed from huge candy canes, and small, multi-coloured sprinkles. What a vehicle. As you spin the wheels, a candy store’s worth of symbols roll by, that look good enough to eat. Amongst them are chocolate bars, rainbow-hued lollypops, blue and pink cupcakes, red gummy hearts, jelly frogs, and yellow and purple donuts. WILDS – the cute yellow Gummy Bear symbol stands in for any symbol apart from the Rainbow SCATTER. FREE SPINS – 3 or more Gummy Bear symbols results in a Free Spins bonus. The number of free spins is determined by the number of Gummy Bears that appear on the reels, up to a tasty 25. PRIZE PICK – 3 or more Rainbow SCATTER symbols trigger this bonus game. You’re given the option to choose up to 5 different, each of which represents a different prize multiplier. The more Rainbows triggered the bonus, the more colours you’ll get to pick. This feature can be triggered during Free Spins, too, which can contribute to some lovely winning streaks. GUMBALL – keep an eye on the candy cane to the right of the reels – this is what we call a ‘wigwag’ (a type of signal, often used in railroad crossings). When the red indicator gets to the top, it will activate the Gumball feature. Gather gumballs in the carriages at the bottom of the reels, and then discover what multiplier values they represent. This could be as much as 500x your bet. GAMBLE – use this feature to gamble your wins by choosing a card suit or colour. Choose correctly to multiply your wins! 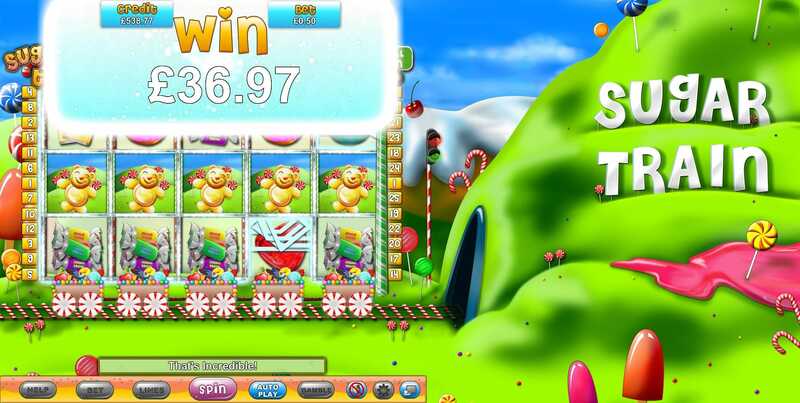 Cute little animations through-out sugar train online slot bring the high-res graphics to life, and I challenge anyone not to be delighted by a dancing gummy bear. Sound effects, too, including happy sounds on win lines, are charming and atmospheric, and perfectly complementary to the theme and flavour of the game. 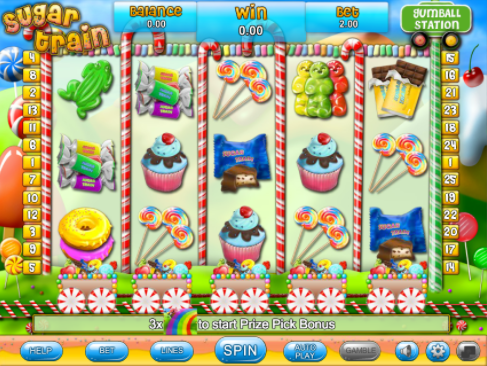 Line and bet adjustment buttons allow you to ‘pick and mix’ to customise the game to your taste. The player can choose between 1 and 25 win lines, and the range of options for your stake is wide, from 0.01 to 25, which means more casual players can just take a little nibble, and more invested players can bite off just as much as they want to chew. There’s also the handy Autoplay function we’ve come to expect from Eyecon games, allowing you to sit back and enjoy the train ride with no effort. And with a 95.0% return to player, you get a good ride’s worth for your money. Put this in the mixing pot with the large selection of bonuses and beautifully-realised theme, and it’s no wonder this is one of Eyecon’s most popular games, with players stumping up for a ticket on this train time and time again.